Cut the heads off (optional, heads absorb too much oil). Gut the smelts and wash under cold water, drain. Put them in a bowl, sprinkle with salt and pepper. Heat the oil in a large skillet over high-medium heat. 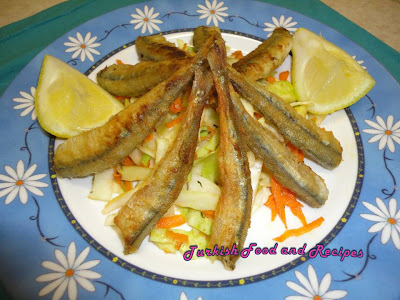 Place the flour in a plate and dip the smelts. To remove the excess flour, shake the fish off. Fry until they turn to a red fried color, approximately for 3-4 minutes. Turn halfway through. When they are done, place on a plate with paper towel to absorb the excess oil. Serve with lemon and Turkish Coleslaw. Also arugula, lemon, onion and radish go well with all kinds of fried fish. Baliklarin kafalarini keserek ya da kesmeden pisirebilirsiniz. Kafalari cok fazla yag cekecektir. Karinlarindan yarip, iclerini temizleyin ve soguk suda guzelce yikayip, suzulmesini bekleyin. Yikanmis baliklari bir kaseye alin, tuz ve karabiber serpip, harmanlayin. Genis bir tavada yagi kizdirin. Unu bir tabaga alin ve baliklari kuyruklarindan tutarak una bulayin, fazla unu silkeleyin ve kizgin yaga koyun. Orta ateste, kizarana dek her iki tarafini da pisirin. Pisirdiklerinizi uzerinde kagit havlu bulunan bir tabaga alin, boylece fazla yag havluya gececektir. Sonra servis tabagina alin ve limon ile servis yapin. Lahana Salatasi dab u tarifin yanina cok yakisir. Ayrica, her turlu kizarmis balik; roka, turp, sogan ve limon iyi gider.